New renderings revealed for Lucas Museum in L.A. - Archpaper.com New renderings revealed for Lucas Museum in L.A.
New renderings revealed for Lucas Museum in L.A.
MAD Architects’ proposed designs for the Lucas Museum of Narrative Art in Los Angeles have undergone a slew of design changes, according to documents filed with the Los Angeles City Planning Commission (LACPC). 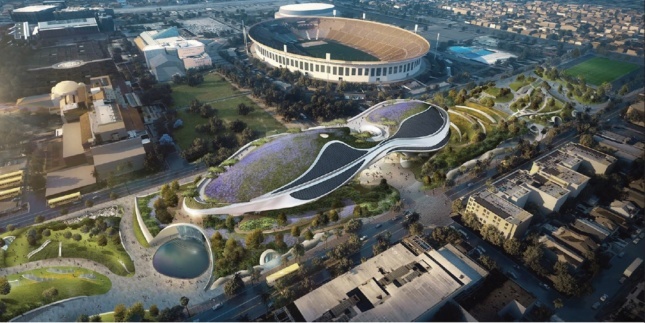 The documents, first reported by Urbanize.LA and filed in advance of a forthcoming meeting between the project’s backers and the LACPC set for May 11, come roughly five months after the museum board chose Los Angeles’s Exposition Park as the preferred site for the new $1 billion complex. L.A. was chosen in January over a parcel on San Francisco’s Treasure Island. The two California cities were briefly in competition with for the complex after backers abandoned an earlier pitch made for Chicago, Illinois. Now, as the project moves toward its projected 2018 construction kick-off, developers for the project are making their way through L.A.’s dense building approval process. The planning document calls for the construction of a 115-foot-tall museum, education, and leisure complex that will contain a restaurant, movie theater, lecture hall, digital classrooms, library, and event spaces in addition to gallery spaces. The project—unlike the proposed bids for San Francisco or Chicago—will contain a massive amount of parking: 2,425 stalls contained within a three-level subterranean garage. The 300,000-square foot complex will be organized with a collection of ground floor open spaces that connect to an 11-acre, park-like site. A rendering contained within the document indicates that the complex has tightened up, programmatically-speaking, and occupies a both a wider footprint and tighter envelope than before. The complex will be organized within an arrangement of dual, three-story piers topped by a continuous, two-level gallery block. The ground floor of the southern pier will contain archives and offices, with educational spaces on the second floor, and the library on the third. The northern pier will contain a pair of theaters and a main entry pavilion for the museum. A rendering included in planning documents shows a sinuous, metal-clad structure topped with trees and planted areas. The renderings differ somewhat from earlier designs and include the addition of a new underground space located below the project site. Construction for the project is expected to begin in 2018 and complete in 2021.